Mike Shinoda wrote rhymes that complement Bennington's melodies on hit singles like "In the End,"
Maxim - The pop music community was shaken to its core Thursday as news broke that Linkin Park vocalist Chester Bennington committed suicide. Sadly, it seems that the ferocious frontman chose that particular day for a reason—it would have been Chris Cornell's 53rd birthday. 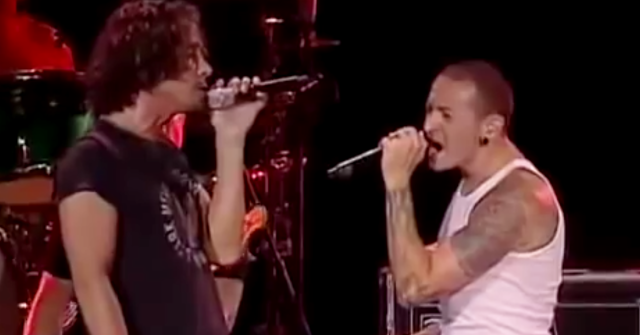 Bennington was extremely close to the late Soundgarden singer, who also hung himself this year. He was godfather to Cornell's children and sang Leonard Cohen's "Hallelujah" at Cornell's funeral, and the pals teamed up for a flawless performance of Temple of the Dog's "Hunger Strike" in 2008. Watch the moving moment above. "You have inspired me in many ways you could never have known," Bennington wrote to Cornell in an open letter after his death. While Linkin Park was undoubtedly influenced by grunge-era bands like Soundgarden and Temple of the Dog--a 90s supergroup featuring Cornell and Eddie Vedder--Linkin Park's distinctive style mixed abrasive vocals and nu-metal riffs with elements of hip-hop and electronica. Mike Shinoda wrote rhymes that complement Bennington's melodies on hit singles like "In the End," while the use of drum samples and synth sounds added an eerie quality to the somber lyrics of "Breaking the Habit." What makes Linkin Park a standout group, though, was Bennington's ability to deliver pitch-perfect performances live.